First vaudeville, then Broadway ’til finally the zany Marx Brothers infiltrated film. Beginning tonight at 8 on TCM you can watch a mini festival of some of their 13 feature films, five of which are included in the top 100 comedies of the American Film Institute, with two of “Duck Soup” and “A Night at the Opera” in the top 12. “Horse Feathers” (1932) airs at 8p.m. followed by “A Night at the Opera” (1935) at 9:15p; “A Day at the Races” (1937) at 11p; “Room Service” (1938) at 1 a.m.; “At the Circus” (1939) at 2:30a, and “Go West” (1940) at 4a. (Hope you’re off from work on Friday, or it’s time for a DVR session). From my perspective, it’s a great alternative to all that football. 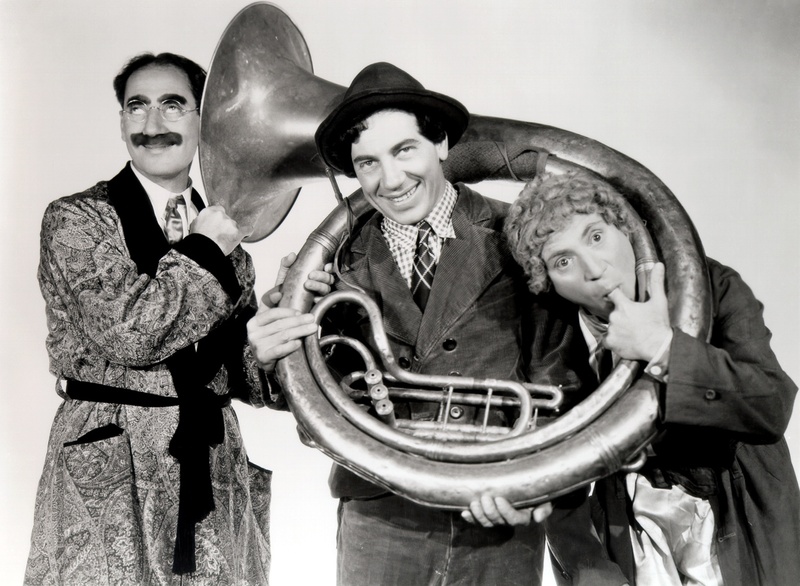 The Marx Brothers’ stage shows became popular just as motion pictures were transitioning to “talkies”. The brothers signed a contract with Paramount Pictures and began on their film career at Paramount’s Astoria, New York, studios, according to Wikipedia. Their first two released films (after an unreleased short silent film titled” Humor Risk”) were adaptations of the Broadway shows “The Cocoanuts” (1929) and “Animal Crackers” (1930). Both were written by George S. Kaufman and Morrie Ryskind. Previous PostFamily-friendly ’39 Steps’ returns to NYC stageNext PostWhy do some serious Broadway shows flop while others don’t?